The One & Only - Leased Ferrari: There's probably no God. Now stop worrying and live your life. There's probably no God. Now stop worrying and live your life. 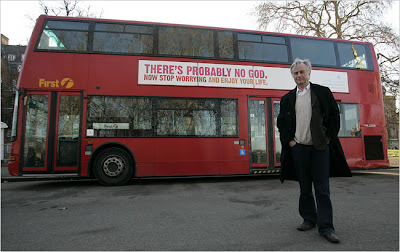 One of my favorite author's, Richard Dawkins, has completed a series of Bus ad campaigns in London, featuring the phrase "There probably is no God. Now stop worrying and enjoy your life." "The archsceptic professor Richard Dawkins today launched Britain's first atheist campaign posting the message: 'There's probably no God. Now stop worrying and enjoy your life' on the side of 800 British buses. The posters – launched in conditions cold enough to freeze a presumably non-existent hell over – co-incided with the Christian feast of the Epiphany, when according to tradition three magi from the East presented the baby Jesus with gifts of gold, frankincense and myrrh. Dr Dawkins, speaking at the launch in Central London, said he would have rather not had the word 'probably' in the advertisement. He said the existence of God was about as likely as that of the tooth fairy." Dawkins is a British ethologist, evolutionary biologist and author. He has written many books on the subject of evolution and is a prominent critic of creationism and intelligent design. My personal favorite book he has written is The God Delusion, in which Dawkins contends that a supernatural creator almost certainly does not exist and that faith qualifies as a delusion (as a fixed false belief).